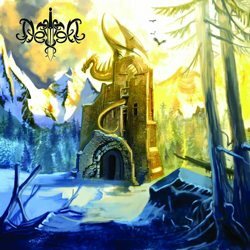 Delion is a new epic folk black metal band from Genève of Switzerland. The band was formed in 2010, but was not so active during its first years, until the end of 2012 when they took things more seriously. In the summer of 2013 they released the 6-track demo “The Beginning” and on May 2014 they self-released their debut EP “Tales of the Northern Realm“. “Tales of the Northern Realm” is a short EP, including an intro and 4 songs, with a total duration a little over 21 minutes. The band is still searching for its musical identity and they are already displaying a huge improvement compared to the almost “midi” sound-quality of their demo, less than a year ago. Their sound is for sure much more natural this time, but still there is a long way to go in terms of production. Their music is a mixture of epic blackened metal with folk and symphonic elements. Distorted rhythmic guitars and black metal screaming vocals are the most brutal elements of their music. On the other hand, melodic lead guitars and synths, used both as epic symphonic layers or as samples of traditional instruments, add a softer touch in their sound. The songwriting is good, with many catchy melodies and a good balance between aggression and melody. Each song has something different to show, which is also very positive. Everything would be much better though with an improved production, especially in keyboards. The addition of authentic folk instruments would also make their effort much more interesting. Their lyrics are in English, dealing with epic fantasy themes around the story of the warrior Delion. I find them to be a promising band, especially because of the huge progress they made in very a short period of time. Their overall aesthetic, sound balance and composing skills are at a satisfying level and if they continue to improve in technical matters, things could become much greater for them. Except for the digital version available in their Bandcamp page, “Tales of the Northern Realm” is also self-released in a digipak CD edition limited to 100 hand-numbered copies, with artwork by NinjaJean. You can visit the Delion’s official pages below for more details.